Effortlessly access more abilities and macros than ever before with 17 mouse buttons including the revolutionary Razer Naga thumb grid. The Razer Naga Epic’s driver software allows you to easily organize your key binds and character abilities for any game by enabling you to fully remap and assign macros to all 17 buttons. 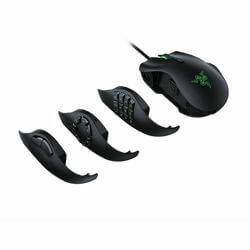 In addition, the Razer Naga Epic also features downloadable in-game addons or integrated in-game support for the most popular MMO games.